So you all should know by now I have a serious love of a fairytale retelling. 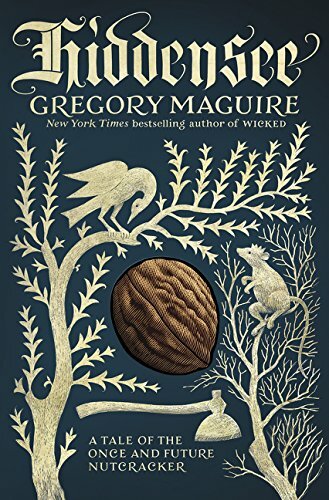 Hiddensee is a re-imagined novel of the infamous Nutcracker story, which I found really unique and was initially, quite excited to read. Dirk grew up deep in the woods, far from any town or village, with the old lady and the old man; until the day he ran away after an accident in the woods left him with one eye and the sneaking suspicion the pair had tried to kill him. The novel follows Dirk as he makes his way through Bavaria, never settling for terribly long in one place. After traveling the world, he sets up shop as a toy-maker, carving beautiful figurines from wood, earning himself quite the reputation. Finally as an old man, he gifts his prized Nutcracker, carved from the wood of that log ago forest in which he was raised, to the sickly Klara, his goddaughter. In what her parents are convinced are fever dreams, Klaras toys come to life at night in an epic battle, the Nutcracker included. Having read many of Maguires novels in the past (Wicked, Son of a Witch, Confessions of an Ugly Stepsister), I had really high hopes for this book. Unfortunately I just really didn't love it. I wanted to love it so badly, but I didn't. I found it boring and uneventful. There were parts that were entertaining and exciting. I was particularly fond of the time Felix and Dirk spent together, and was pretty bummed that nothing ever really transpired between the two as far as a romantic relationship. It was confusing at times and hard to follow, perhaps it was too nuanced with hidden meanings that I really just didn't understand? Either way, this was my least favorite of Maguire's books. Not really where he was trying to go with this book, but I would have found a book about Felix and Dirks relationship much more appealing than the genesis of the Nutcracker (which really only comprised a very small portion of the book). Overall, this book wasn't for me, but I wouldn't discourage you from reading if you enjoy this genre.